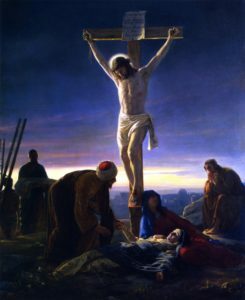 Uniting Suffering to the Cross - My Catholic Life! My hope is in Jesus, my only treasure is the Cross…I will bless the Lord at all times and His praise shall be always in my mouth. I adore the will of my God. What does it matter to me’ O beloved and lovable will of God, if you take from me all earthly goods, reputation, honor, health, and life; what does it matter that you make me descend into the depth of humiliations. What does it matter – if, I find the hidden fire of Thy heavenly love? How happy I should be if I could die for Thee and for my fellow creatures. Jesus, Priest and Victim, I unite the sacrifice of my life and the cross I carry to Thy blood shed for me. I shelter myself in Thy wounds and I expect all strength from Thee. My heart is ready, O Lord, my heart is ready. I only wish to do all for Thy greater glory. I rely upon Thy strength when the supreme moment comes and not upon my own. I have put my hopes in Thy mercy. I recommend to Thee all to whom I may die indebted, and I beg Thee, that having given my life and my blood for them, my friends will pay my debts after my death.